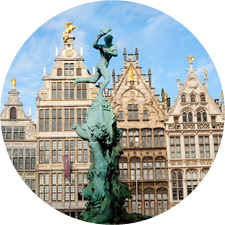 Antwerp, Belgium is a part of the Logistics Plus® network. This office provides air and ocean freight forwarding, inland ground and rail, warehousing and distribution, project cargo, import/export, and global trade compliance services. The Port of Antwerp employs 150,000 and is located in the heart of the European Union. It features multi-modal accessibility and connects inland Europe to the world. It offers rail, truck, feeder vessels, ocean vessels and inland transport. While having to cede the honor of being the biggest container port in Europe to Rotterdam – which, as it happens, is only a hundred miles away – Antwerp is your port of call for heavy and oversize cargo with a great number of specialized trucking companies and lighter services on Europe’s extensive waterway network at hand. Antwerp is a major hub for shipments to and from the African continent. Antwerp is also home to a Logistics Plus office where we proudly serve both small and large businesses throughout the region. Our employees in Antwerp speak 6 languages (Dutch, German and French native and English, Russian and Chinese on top of that) and have more than 20 years of experience in freight forwarding with a special focus on the heavy, oversize and special cargo. So whatever you want to move, wherever it’s coming from, wherever it’s going: our Antwerp team is sure to find the optimal solution for you. If you’re located in Antwerp, or any other surrounding community, your friends at Logistics Plus are ready to provide you with local, domestic, and global transportation and logistics services. Additionally, we’ll show you how our people in Belgium put the “plus” in Logistics Plus by doing the big things properly, and the countless little things, that together ensure complete customer satisfaction and success!